Rosa's Ride: JFK Library Celebrate! Home > Events > Performances > Rosa's Ride: JFK Library Celebrate! Official Website: Rosa's Ride: JFK Library Celebrate! 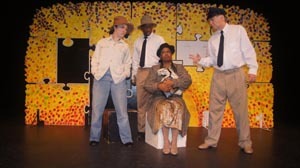 Take a ride through history with Flying Ship Productions as they present a musical play about Rosa Parks, an ordinary woman who became a civil rights heroine. Learn the real story behind Ms. Parks' historic moment, and enjoy the musical tunes of Rosa's Ride! Space is available on a first-come, first-serve basis. Please call 617-514-1646 to reserve tickets. The Kennedy Library is pleased to present the Celebrate! series for family audiences and children ages 5 and up. The one-hour performances highlight America's rich cultural diversity through the arts. The Celebrate! series, appropriate for family audiences and children ages 5 and up, highlights America’s rich cultural diversity through the arts. This program is tied directly to President and Mrs. Kennedy's concern for and support of the arts and culture in a democratic society. Thanks to generous support from the Highland Street Foundation and the Mass Cultural Council, all performances are free and take place in the Stephen E. Smith Center at the John F. Kennedy Presidential Library and Museum (Columbia Point, Boston, MA 02125). Please note that in order to optimize your comfort and enjoyment, reservations are required for all visitors to this free program. Make a reservation below or call 617-514-1644 and leave a detailed message. All large groups must speak with a staff member a week in advance to ensure that there will be adequate seating. Children are seated on a carpeted floor with their caretakers and space is available on a first come, first served basis. Children must be accompanied by an adult. Find more Fun Things to Do in Boston on our Boston events calendar.